Knowing that one of the largest investments of your life is in good hands can put your mind at ease. Craftsman Home Remodeling specializes in Mold Remediation and Mold Removal. We are a fully insured, licensed, and bonded company that is ranked A+ on the BBB. This means that by choosing our certified technicians, you will in fact get the work from people you can trust, with only the absolute very best quality of work that you deserve. Mold can do much more than just cosmetic damage to your home. The airborne spores can enter our lungs and cause problems including coughing, inflamed glands, sneezing, asthma attacks, and in some extreme cases, even permanent lung damage. Unfortunately, keeping your home clean is not always enough. Although mold is encouraged by dusty, warm and damp conditions, it can infiltrate even the most spotless home. Once it begins to grow, its spores become airborne. This means that it can enter our lungs and take possession of other parts of our homes. It is surprising how even the smallest growth of mold can give rise to a major problem. Sometimes getting rid of one small patch of mold just isn’t enough. Because mold is airborne, it can quickly and invisibly spread, and until the damage is done, you may not even know it was there. Without testing, it can be difficult to know the full extent of the problem. Here at Craftsman Home Remodeling, our experienced inspectors can get to the root of the problem quickly and with a minimum of fuss. Using the latest equipment, including thermal imaging and moisture meters, we will assess the condition of the whole property. 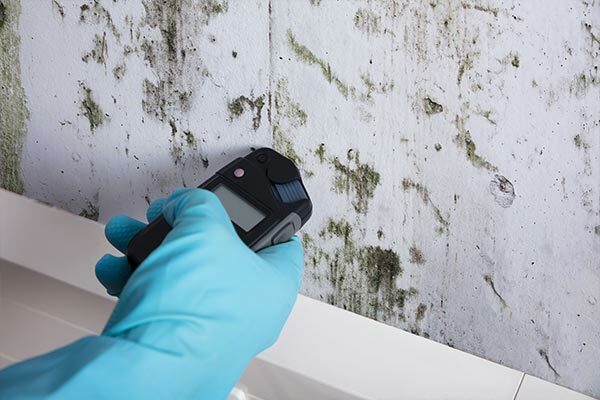 If you have come across mold in your home, it is well worth having it tested to discover the full extent of the problem. What you originally thought was a small problem in the bathroom, could actually have originated in some unseen area in the bathroom, and vice versa. Here at Craftsman Home Remodeling, our inspectors begin the mold assessment process by making a visual assessment of the situation. We then measure moisture levels around the area to determine where the mold could have originated or spread to. Where mold is found, our inspectors will take a swab which will then be sent to a 3rd party lab for testing. A sample of the air in the property is also taken in order to determine the level of airborne spores. Some types of mold are more toxic than others; it’s important to understand the severity of your problem. Anyone who has ever tried to eradicate mold will tell you, mold can be quite a remarkably resilient substance. Mold is encouraged by the damp conditions created by cleaning, and can penetrate deep into wallpaper, plasterboard, grout and fabric. In most cases, surface cleansing will only get rid of the surface mold, and the problem will ultimately remain. This is perhaps not surprising when you realize that airborne mold spores cannot be removed by conventional procedures alone. Craftsman Home Remodeling offers a full mold remediation service to remove all traces of mold and airborne mold contamination. We do this by stopping the contamination in its tracks, preventing its spread, and then by thoroughly removing all traces of the mold itself. We believe in providing a professional and fully ethical mold remediation service. This is why we have chosen to adhere strictly to all EPA regulations and guidelines, and to use only EPA registered mold disinfectants and encapsulates. All of our solutions are fully non-toxic and biodegradable. You’ll never have to worry about introducing dangerous substances to your home or business. Mold removal cannot legally be performed by anyone, but here at Craftsman Home Remodeling we have chosen to employ only fully qualified, highly experienced licensed mold removal workers and we are New York State licensed mold remediation contractor. Customer satisfaction record is spotless; and for good reason. The materials we use are scientifically formulated and our encapsulation materials are guaranteed. Even after your mold problem has been solved, we can help you deal with the aftermath. Unlike most other mold remediation services, we’ll even help you with remodeling after an extensive mold problem has been dealt with. If you would like to ensure that your mold problem is eradicated in a safe and thorough fashion by certified experts, contact us today! The fact that it looks unsanitary is not the only reason to want to prevent mold growth inside your home. When you have mold indoors, it can lead to health problems. Our Mold Remediation Service is unparalleled however, nothing can beat Mold Prevention. Here are some mold prevention tips below. The right temperature – Mold needs the right temperature to grow. Unfortunately, the right temperature is anywhere between 30 to 100 degrees. This means that the average household indoor temperature is always suitable to allow mold to grow. Necessary moisture level – Mold cannot start to grow until the room has a humidity level of 65% to 90%. Any lower, and the mold simply cannot grow. Increase air ventilation. Use fans as needed. Cover cold surfaces and tubes with insulation materials. If you notice condensation, remember to dab it dry as quickly as possible. Try to find out where the moisture is coming from.